Oh, this is just genius. Do you know how you put all of your money into beer? Well, now you can put your keys, makeup, mints, and any other stuff you need for a night out drinking into beer as well. No, not a literal beer, you nut! 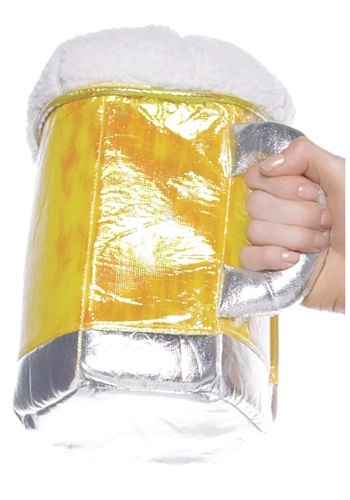 A beer-shaped purse. This is also the perfect thing to use to smuggle beer into places. Who’d ever think to check the beer-shaped thing for beer? It’s the perfect crime! And this is the perfect purse for every occasion. A night out drinking? An important court date? Your own intervention? It doesn’t have to match what you’re wearing. It’s what’s on the inside that counts. And what’s inside of you? That’s right: beer! Good quality and a fab accessory for German or Octoberfest costumes. Everyone loves it. Love this. It's so cute and adorable. Really sturdy and lots of room to hold everything I need on a night out. Do recommend as an accessory.